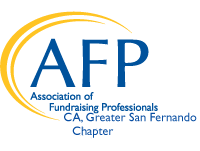 Join the AFP Greater San Fernando Valley Chapter as we present our 2nd Annual Conference for Fundraisers. This day-long event will feature expert speakers on a variety of topics of interest for your fundraising team. From a panel discussion on donor-centric fundraising to specialized sessions on telling your organization's story, getting the most out ofyour database reports, and more - you won't want to miss this very special event, back by popular demand in its second year! Pre-Register Today for early-bird discount until April 15th! $65 for chapter members, $90 for non-members Want to join? Contact us to learn how! The event includes breakfast and lunch and is an excellent opportunity for any member of your team who would like to dive a little further into the world of professional fundraising.